The internationally sold versions of Samsung's Galaxy S8 and S8+ are now finally in the process of receiving the November security update. As usual, this includes patches from Google, as well as Samsung-specific fixes. You get 61 general Android vulnerabilities fixed, alongside six exploits found only in Samsung's software. Additionally, the widespread KRACK Wi-Fi vulnerability is patched too. The Korean company also threw in some Bluetooth-related bug fixes, which means the protocol should be more stable. The updates are now rolling out to devices purchased unlocked in the Netherlands, and should spread to other markets in the next few days. 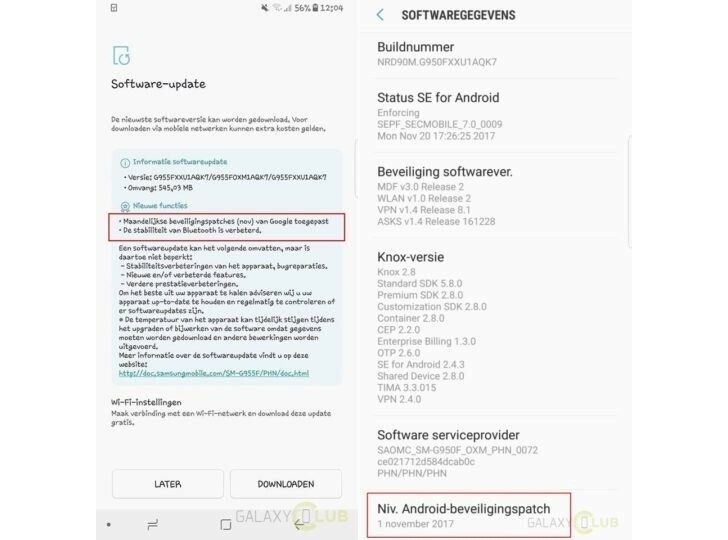 You're looking at a 545MB download, and once you install the new release your Galaxy S8 will be on build G950FXXU1AQK7. For the S8+, it's G955FXXXU1AQK7. If you haven't yet seen the update notification pop up on your handset and are impatient, you can try manually checking by going to Settings > Software update, maybe you'll get lucky. Update: In a related news, the Samsung Galaxy S7 has started receiving a new update in India. Arriving as build number G930FXXU1DQJB and weighing in at around 400MB, it's a security update that brings along Android fixes for the month of October. Shamesung effectively ruined the already excellent camera on the S7 after the update and now it's as good as cheap junk Chinese phones. I'm sick of planned obsolescence strategy..